If you’ve landed on this post, that means you’re probably looking for The Ordinary products for general anti-aging, preventative care. Retinoids are a class of actives chemically related to Vitamin A and help with concerns such as acne, anti-aging, and hyper-pigmentation. They work by helping turn over your dead skin cells at a more normal rate and promoting collagen production. This, in effect, helps to renew your skin and promote healthier and younger looking skin. Downside of retinoids: Some people may experience mild irritation when they start to use retinoids. As skin ages, we start to see skin sag, and part of the reason is because of the loss of collagen and moisture. Collagen is produced naturally by our bodies, but the aging process slows the production of this essential protein. To help skin looking firm and supple, serums rich in peptides as well as oils and moisturizers will aid in collagen production and helps keep the skin moisturized are also essential in an anti-aging skincare routine. AHA, also known as alpha hydroxy acids, are chemical exfoliants that help get rid of dead skin cells that build up over time. Your skin sheds dead skin cells naturally, but the process slows over time as you age. When dead skin cells build up and your skin can’t act quickly enough to get rid of the buildup, the result includes wrinkles and loss in firmness as well as dull skin and clogged pores. Adding an AHA chemical exfoliant once a week to your routine may help you achieve smoother, brighter looking skin. 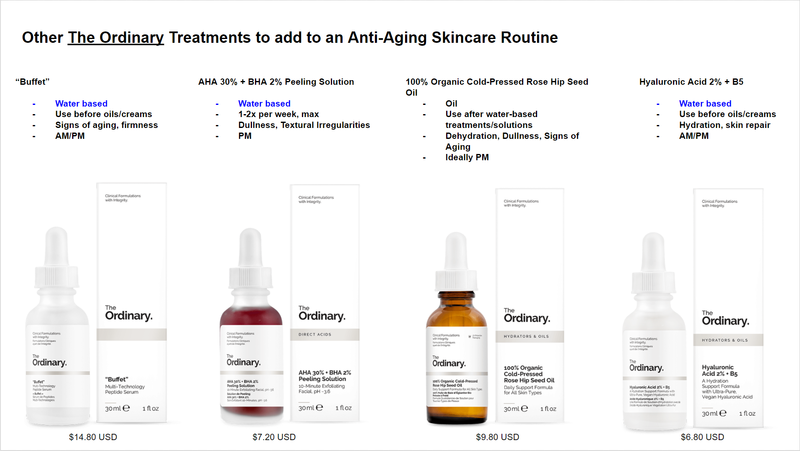 The Ordinary offers all of these treatments in their portfolio, at different levels of potency. Which one you use will depend on personal preference and your skin’s tolerance level of actives. Any texture-related issues that you want to further address: rough skin, uneven skin tone? Any other specific skin concerns I want to target? As a general rule of thumb, I would purchase three treatments from The Ordinary for a good anti-aging skincare routine: 1) a retinoid, 2) a peptide serum, and 3) an oil to aid in moisturization. The difference between these 2% in Squalene and Emulsion is the base – for those who prefer a “Creamy, hydrating emulsion” you would pick the 2% Emulsion product but please note that this format does not contain pure retinol. 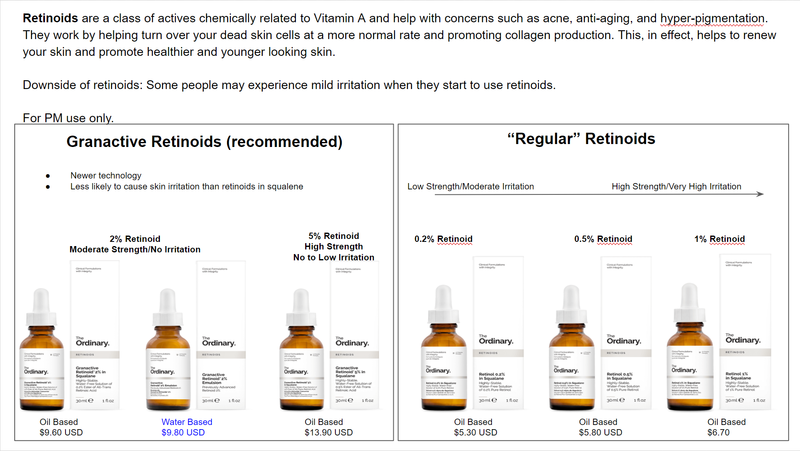 The retinoid in squalene offers pure retinol formulas and what The Ordinary describes as “better compatibility with several steps in a regimen.” In other words, unless you have a strong preference for a creamier, emulsion format, it’s recommended that you go with the 2% or 5% squalene products. Between the 2% or 5%, it’s based on your skin’s sensitivity factor. While the Granactive technology reduces the irritability factor, you sill need to consider your own skin’s needs and reactiveness to a retinoid product. If you have concerns or reservations, it’s best to start with the 2% and work your way up as your skin builds up tolerance. After you’ve picked a suitable retinoid from The Ordinary’s collection, I would pick up a peptide rich serum such as “Buffet” – this formula is suitable to use as a treatment both in the morning and at night as a generalist serum to target signs of aging and loss of firmness. Another product I would pick would be an oil from The Ordinary’s “Hydrators & Oils” collection. They have many different hydrators and oils to pick from at very reasonable prices (100% Plant derived squalene, organic cold pressed rose hip seed oil, Moroccan argan oil, virgin marula oil), so which one you pick is dependent on personal preference. (Please note that Squalene is not an oil, but an oil-alternative that also has high emollience and acts as an exceptional hydrator for the skin.) For anti-aging concerns and needs, I would recommend going with the Rose Hip Seed oil, as this is high in omega fatty acid content which is ideal to maintain moisture and combat signs of aging. 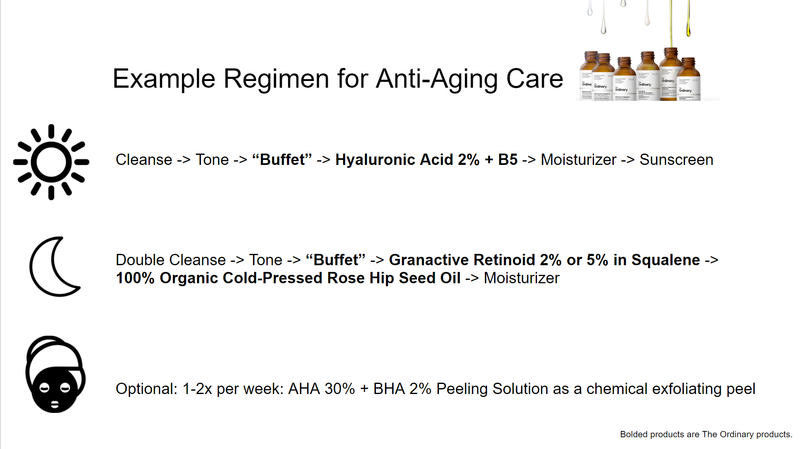 Some might prefer Marula Oil as it’s a more “luxurious” oil and Rose Hip Seed may be more polarizing due to scent, but if the aroma doesn’t bother you, Rose Hip Seed oil is more targeted as an anti-aging product vs. Marula, which is suitable more for people who don’t have major skin concerns and just want the added benefit of an oil to support their hydration needs. If your skin is especially dehydrated, or need an extra boost of moisture at times (winter, dry climate/season, travel), adding the Hyaluronic Acid 2% + B5 is an excellent choice. Hyaluronic acid is great to add to any skincare routine that needs a boost of moisture as it hydrates well, absorbs easily, and is pleasant to use (and cost effective to boot!). Lastly, if you do have other skin concerns you want to target, such as rough skin or want extra brightening benefits, you could consider adding the AHA 30% + BHA 2% Peeling Solution as a 1-2x exfoliating treatment to your routine. This will help to renew your skin’s surface at a faster rate, and address any dullness or texture concerns you may have. Again, if you have sensitivity concerns, however, it’s best to start with a 2% retinoid and allow your skin to build up the tolerance over time before using a high-active concentration such as this product. The AHA 30% formula is a very high concentration of free acid: only recommended for people who are comfortable using chemical peels at home and do not have sensitive, peeling, or open wounds in the skin. Here’s the video that explains the above information in greater detail! And a handy cheat sheet for reference!